I like furniture that is versatile since furniture can take up a lot of space. That is why the Bayside Furnishings 9-cube Room Divider Bookcase is an essential piece of furniture for anyone's house. You can use any or all of the cubby holes as bookshelves or a shelf for vases or picture frames. That or you can use the cubes in conjunction with the bins as a place where kids can put toys or supplies for arts and crafts. They can just grab the whole tote and take it with them when they want to play. 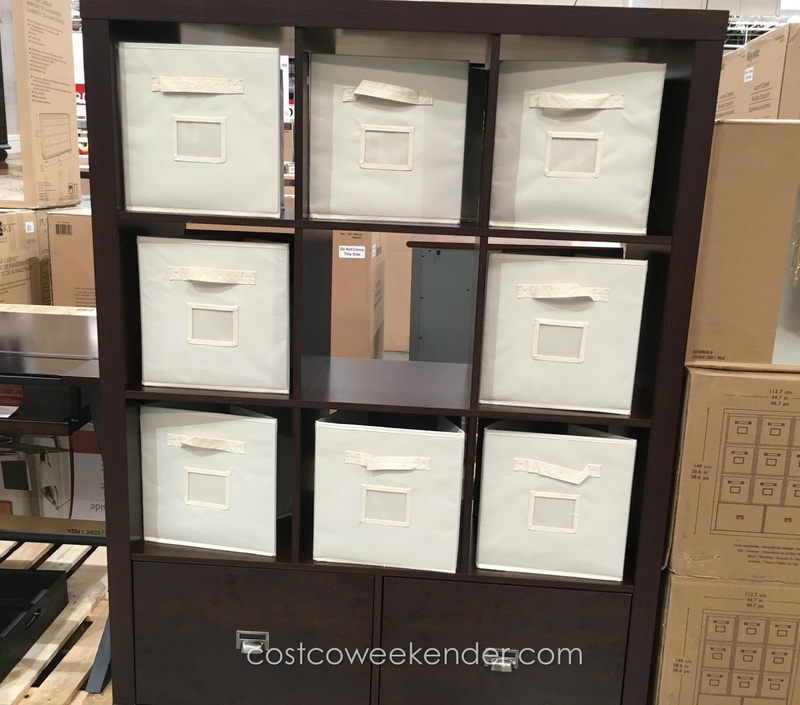 You can customize the Bayside Furnishings Room Divider in any configuration of empty cubes and fabric bins. In addition to the 9 cubes, you also get 2 drawers for additional storage. Put this bookcase against the wall or in the middle of an open area to partition large spaces. You can use put the Bayside Furnishings 9-cube Room Divider Bookcase in a family room, living room, or even in a kid's bedroom making it a practical piece of furniture for your home. 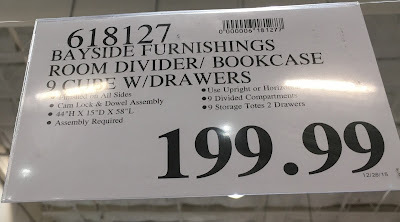 Hello @Unknown, I don't have the exact dimensions of the fabric bins for the Bayside Furnishings 9-cube Room Divider Bookcase, but it does indicate that it is 15 inches deep. I'm guessing that the width and height are around that number give or take a couple of inches or so. This is just a guess though. Any info on color choices? Hello @Isaac, I only saw the Roasted Hazelnut color for the Bayside Furnishings 9-cube Room Divider Bookcase at Costco. I'm not sure if there are other colors that it's available in. Happen to have the box dims? Hello @Mark, sorry I didn't get to measure the box for the Bayside Furnishings 9-cube Room Divider Bookcase at Costco. Do not purchase this unit!!!! Looks much better than it actually is. I had such high hopes for this unit as I have never been disappointed by Costco before. I have assembled many Ikea units in the past, so I am not a newbie at Flat Pack, but this one beat me. I returned all the shards to the store. It is very poorly designed and does not have enough cam locks to make it stable. This unit uses brittle dowels as mechanical connections instead of just for alignment. To top it off, the entire unit collapsed while attempting to line up the warped side. All the dowels cracked in half, the cam bolts seated in plastic ripped out. Hello @Bert, thank you for sharing your thoughts on the Bayside Furnishings 9-cube Room Divider Bookcase. That's awfully disappointing to hear how it just didn't hold up well for you. Who would've known about the poor construction of this piece of furniture? Hello @Unknown, ya the Bayside Furnishings 9-cube Room Divider Bookcase is great in a kid's room. It sure is a lot better to have your child put his toys in the fabric bins instead of the floor. I agree with 100%. Tried to assembke it 3 times; it falls apart. I just returned it to costoco.As bert said , it is poorly designed, unsafe product. The worst product ever i bought from costco. Diasappointed. Hello @Anonymous, that's awfully disappointing to hear that the Bayside Furnishings 9-cube Room Divider Bookcase just didn't work for you. 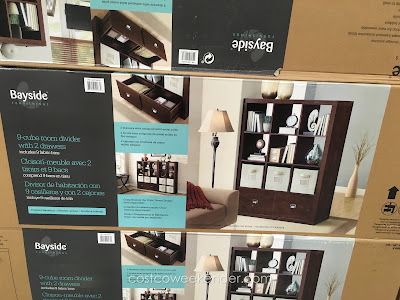 It's a good thing Costco has a pretty good return policy when it comes to products you're not satisfied with as in the case with the Bayside Furnishings 9-cube Room Divider Bookcase that you purchased. Any idea where I can purchase on of these if my local Costco doesn't have them now? They currently have the similar product with 8 shelves but no drawers. Cheaper but smaller. I'd like to buy the one this article is referring to. Thanks for the response. I spoke to management at my Costco and they pretty much said the same thing. They gave me the actual manufacturer name and I called them. They said once they stop receiving orders of that size, they do not produce the item anymore and do not keep stock since they are not a retailer. They said even if they did, it would be drastically overpriced from what Costco offers. Thanks for your help. No prob @cpnow123! Always glad to help!